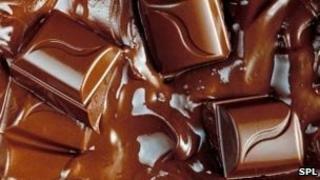 A chemical in cocoa could soon be turned into a medicine for persistent cough, researchers claim. Scientists are carrying out the final stages of clinical trials of a drug that contains theobromine, an ingredient found in chocolate and cocoa. The UK developers say the drug could be on the market within two years. Every year in Britain an estimated 7.5m people suffer from persistent cough - a cough lasting more than two weeks. Most current medicines used to control the symptoms are opiate-based ones like cough syrups containing codeine, a narcotic. But in October the Medicines and Health products Regulatory Agency (MHRA) said under-18s should not take codeine-based remedies, because the risks outweighed the benefits. Researchers say the new theobromine treatment should not have this problem. And being flavourless, it can be taken by those who dislike chocolate. Theobromine is thought to work by inhibiting the inappropriate firing of the vagus nerve, which is a key feature of persistent cough. The final stage of the drug's testing is set to begin in the next few months. The drug, called BC1036, is being developed by the private UK company SEEK. Manfred Scheske, CEO of Consumer Health at SEEK said: "I am very excited to announce the progression for the late-stage development of BC1036, which has the potential to dramatically impact the treatment of persistent cough and could greatly benefit the quality of life of persistent cough sufferers." Professor Alyn Morice of the Hull Cough Clinic said there was a need for new treatments. "Thousands of people across the UK suffer from persistent cough, and due to the drawbacks of current opioid drugs such as codeine, we are in desperate need of a non-opioid treatment with a drastically improved side effect profile for patients."